Water soluble wheat fiber, organic alfalfa leaf powder, organic barley grass, organic wheat grass powder, spirulina (spirulina platensis) micro-algae, apple pectin powder, brown rice bran, chlorella microalgae, flax organic seed, barley malt, lecithin, pineapple fruit powder, kamut grass (triticum turgidum ssp. 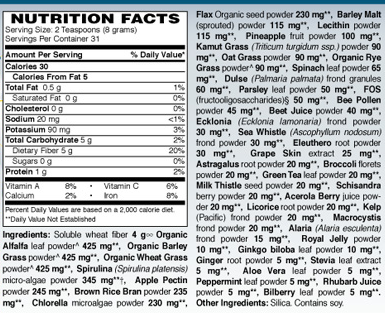 ), oat grass, organic rye grass, spinach leaf, dulse (palmaria palmata) frond granules, parsley leaf powder, fos (fructooligosaccharides), bee pollen powder, beet juice, ecklonia lamonariam, frond powder, sea whistle (ascophyllum nodosum), eleuthero root, grape skin, astragalus root powder, broccoli florets, green tea leaf, milk thistle, schisandra berry, acerola berry, licorice root kelp, macrocystis, alaria esculenta, royal jelly, ginkgo biloba leaf powder, ginger root, stevia leaf extract, aloe vera leaf, peppermint leaf, rhubarb, bilberry leaf. Other ingredients: silica. contains soy.